Looking for the best place to get a coffee in Rome? Italy is a great place to sample coffee as it is the home of espresso and has a very developed coffee culture. We’ve visited Rome multiple times, and on those visits we’ve drunk a lot of wonderful cups of coffee in the Eternal City. So we wanted to share some of our favorite cafés in Rome to get coffee, with a focus on central locations. Need a coffee break after a visit to the Pantheon, Piazza Navona, Spanish Steps, or Borghese Gallery? We got you covered. These locations vary from simple local cafes to a 18 century upscale historical coffeehouse to a former artist studio! Before we get into our cafe recommendations, we’ll first share a number of tips and advice on ordering and drinking coffee in Rome, including typical coffee drinks, how to order coffee in Rome, how to save money, coffee tours in Rome, and some information on service charges in Italy. If you have been to Italy before, you can skip that and move on to the café recommendations! 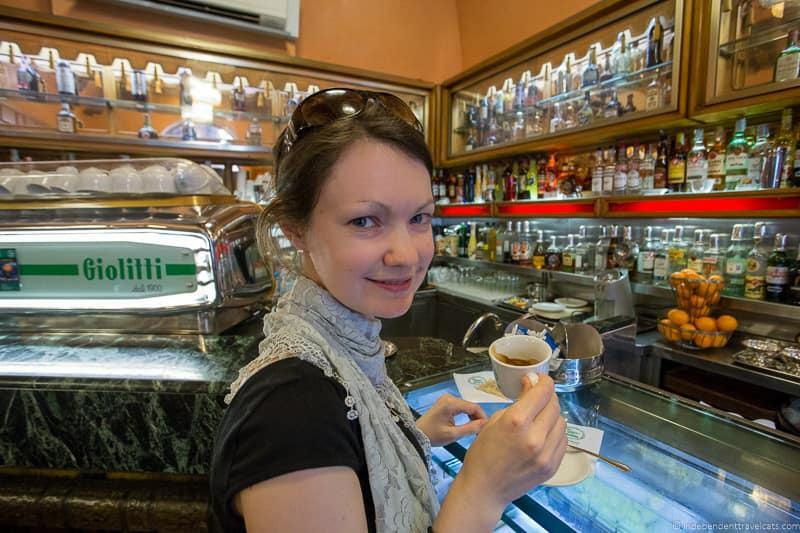 What is the most typical way to have coffee in Rome? How do you order coffee in Rome? What are typical Italian coffee drinks? When do most Italians drink coffee? What is the best way to save money on coffee in Rome? What to expect of the service in Rome? What are the service charges on the bills? Are there any Coffee Tours in Rome? Are there any good tea places in Rome? While no coffee is actually grown in Italy, the county is famous for its roasting and blending of coffee and for its coffee culture. 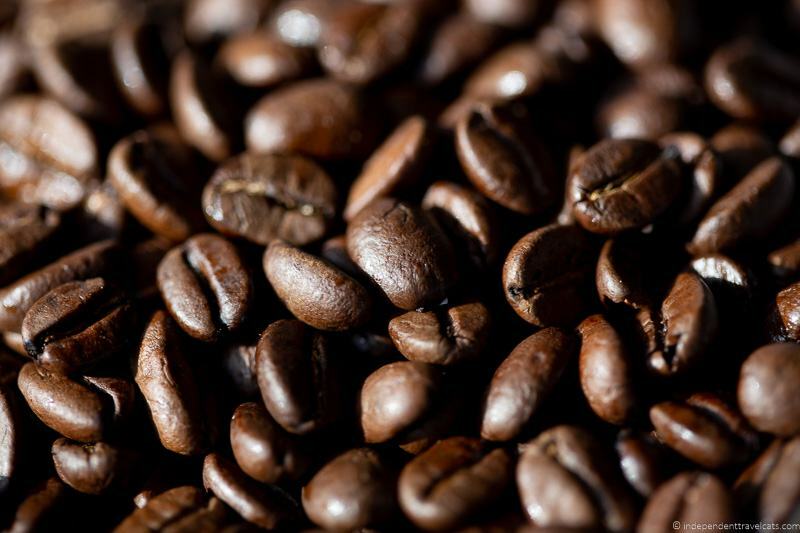 Coffee was first introduced into Italy in the 16th century. Over the centuries, Italy has developed a deeply ingrained coffee culture with a number of rituals and traditions, and Italy is sometimes referred to as the “spiritual home” of coffee. 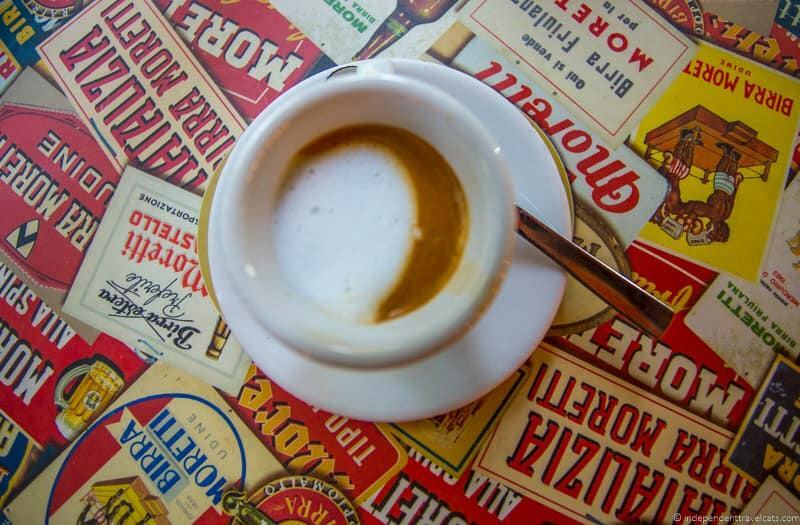 Perhaps the most notable coffee connection is that it was in Italy where espresso was invented in the 19th century, including the process, the first espresso machines, and the drink. Espresso refers to both the brewing process (forcing a small amount of nearly boiling water under pressure through finely ground coffee beans) and the resulting drink. Italian has also given us the names of many espresso based drinks used in the English language (e.g., cappuccino, caffè latte, caffè macchiato). Some of the Italian traditions and unspoken rules around coffee can make it confusing for tourists to order coffee in Rome, so we’ll give you a quick run down on how to order coffee in Rome, common types of coffee, ways to save money, and also some information about service charges and tipping. If you think that most Romans are lingering over their coffees on a picturesque café terrace, you’ll soon discover that this is not very typical. In fact, most Romans never even sit down to have their coffee. Many Romans have a favorite neighborhood bar and generally know the barista and some of the other patrons by name. Typically, coffee is drunk standing up at the bar. A common order is for a caffe (a single espresso shot with a nice crema) that is then consumed in a couple of gulps. Although many Italians take their coffee seriously, there is not normally much lingering! Note that I will use the word café or coffeehouses for denoting the coffee places since those are the familiar words for many travelers. But they are normally referred to in Italian as bars rather than cafes, since most patrons stand and have their coffee. Many of course also serve alcohol as well. It is polite to announce a greeting like buon giorno after entering a cafe or restaurant. Decide what you want to order. If you are not sure what kinds of coffees are typical in Italy, skip down to the next section. Check the price on the menu. Normally there is a menu clearly posted, and it will usually have different prices for those drinking “al banco” (standing up at the bar) or those drinking the same drink “al tavaolo” (sitting at a table). Note that if you choose a table, you’ll pay more for the “servizio al tavolo” (table service). Sometimes the differences in price is little, sometimes it is huge so do check if you are considering sitting down. By law, all bars have to state the prices for bar and table service and if you can’t find it ask for the “listino prezzi”. There are some places that don’t charge different amounts for bar versus table service, but this is uncommon. Decide where you want to drink your coffee, bar or table. Most locals drink their coffee at the bar, but if you’d rather sit and linger, consider a table. If you choose to drink your coffee at the bar, figure out the proper ordering process by watching others or asking if it is not clear. To us this was the most confusing part of the process as at many cafes you order first and pay the cashier at the register, and then hand your receipt to the barista, and then drink your coffee. But in some cafes, you order first and get your coffee, then pay at the register after you have finished your coffee. Most people at the bar are in and out within 5 to 10 minutes so it normally doesn’t take long even if it is busy. If you choose to drink at the table, you have the option to linger over you coffee and enjoy it. You’ll get the bill and pay after your finish. 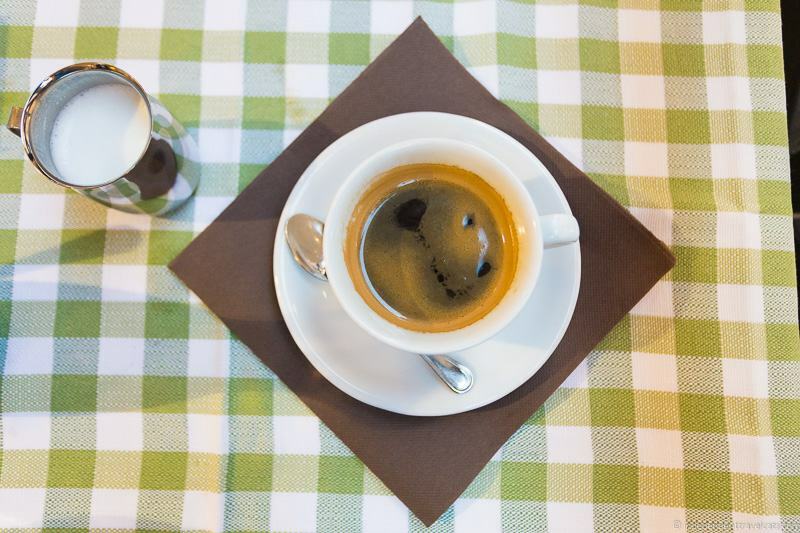 There are some common drinks you’ll find at any cafe in Italy, but there are a lot of possibilities and coffee menus can be long with all the variations. There are also sometimes cafe-specific specialities as well as regional drinks from around Italy that pop up on Roman menus as well. caffè decaffeinato: a shot of espresso, decaffeinated. You can ask for any drink to be decaf, just say decaffeinato at the end. caffè macchiato: an espresso shot with a splash of milk (usually steamed) added. A caffè macchiato caldo means with warm or steamed milk, and caffè macchiato freddo means with cold milk. This is my go-to drink in Italy. cappuccino: a drink with approximately equal parts espresso, steamed milk, and foamed milk in that order. Traditionally it is made in Italy with one shot of espresso, but 2 shots are also common which you can request if that is what you want. Popular breakfast drink in Italy. shakerato: a shot of espresso that is shaken with ice. Sugar can be added before the James Bond-style shaking. Usually served in a clear drinking glass or martini glass. Drank primarily in summer. A cup of coffee is normally served with a sugar packet or two. Sometimes it is also accompanied by a tiny sweet biscuit, chocolate, or other sweet. If the sugar (zucchero) is not given to you, you’ll normally find it on the bar or at your table. Remember caffè means a shot of espresso to Italians and latte in Italian just means milk. So it you say latte, you are just ordering milk. Most good baristas will clarify with you, but it is good to know what you want to order. You’ll have a hard time finding flavored or complex coffee drinks (pumpkin spiced lattes, frappuccinos), filter coffee, or to-go coffees in Italy. Although the first Italian Starbucks opened in 2018 in Milan, and a number of new stores are expected in Italy, including Rome. But even if you are able to find an iced skinny caramel latte with mocha drizzle in Rome, we recommend trying some of the local coffee drinks first and give them a chance! If you enjoy drip coffee or filter coffee, ask for a caffè americano, it is espresso based but has extra water so is more similar to drip coffee in terms of strength. If you want it with milk, just add con latte. A lot of people ask about the caffeine content of espresso versus filter coffee. Although an espresso shot has a more concentrated amount of caffeine, it generally has less caffeine than a regular sized cup of filter coffee. 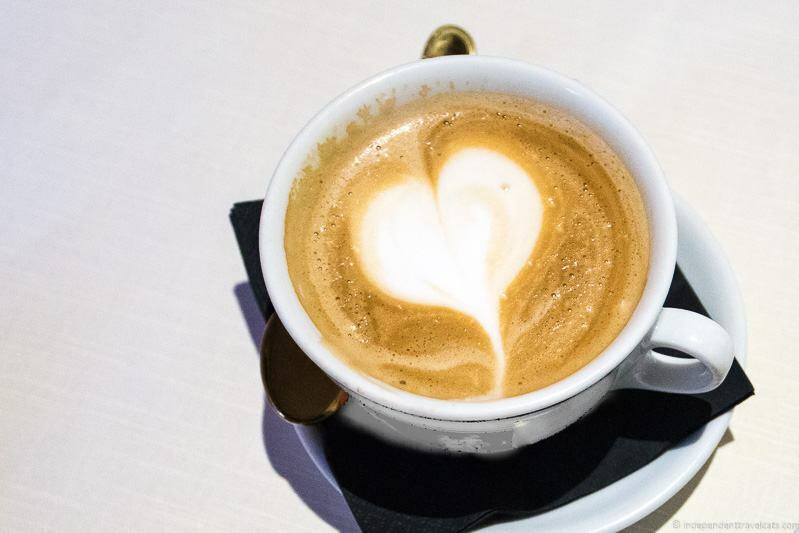 Italians drink coffee throughout the day, but like in many countries, breakfast and the morning is a popular time and so is an afternoon pick-me-up. A shot of espresso is also commonly drunk after meals, especially after dinner, as it is believed to aid in digestion. Many get coffee on the way to work and may even stop by to get a coffee from their favorite barista multiple times a day. The most popular drinks are all espresso based and a simple caffè (a shot of espresso) is a common order. In the morning, a typical Italian breakfast is a cappuccino with a cornetto (similar to a croissant but sweeter) or other bread or pastry. Milky coffees, such as cappuccino, latte macchiato, and caffè latte, are normally only drunk by Italians in the mornings and not after meals. You’ll likely encounter a guidebook or person who will tell you not to order any milky coffees after 11am as few Italians would do this. This is true that most Italians would not order these drinks later in the day and many find the idea of drinking milky coffee after a meal a bit disgusting. But we’d recommend ordering whatever drink you want (that is on offer on the menu of course), as unless you speak Italian, they already know you are a tourist. Yes, you may get a strange look from the barista if you order a cappuccino at 3pm but ordering something you don’t really want isn’t going to make you fit in either. Its your holiday and your money, drink what makes you happy! Drink your coffee standing at the bar like most of the locals. Prices are regulated by law, and the “al banco” prices are almost always lower than the price you’ll pay for the same coffee had at a table. Sometimes, especially in tourist areas, this difference can be fairly large. A 1 euro espresso shot at the bar may be a 3 euro espresso at the table. 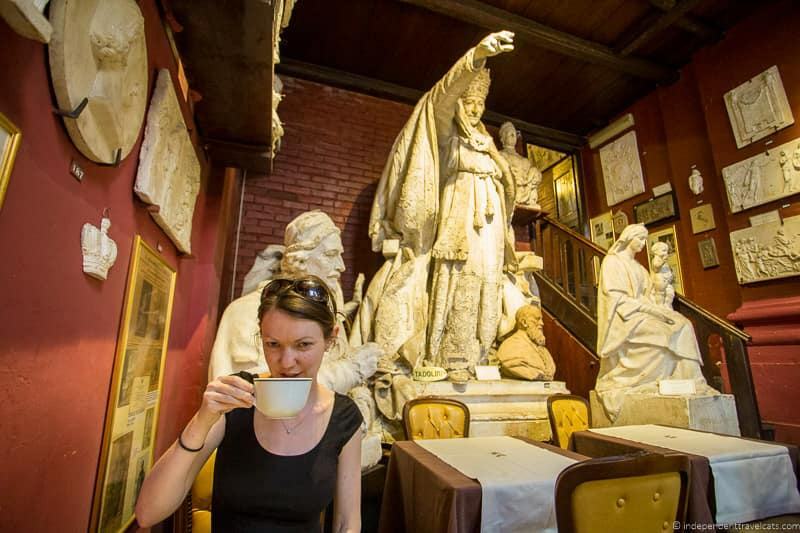 Seek coffee spots in Rome outside the main tourist areas. Avoid famous cafes, including some on the list we recommend. Although note that a caffè is not going to break the bank even at the most famous coffee houses, if you have it standing at the bar. Avoid fancy coffees and stick to the basics. The cheapest coffee drink on any menu is almost always going to be a caffè. 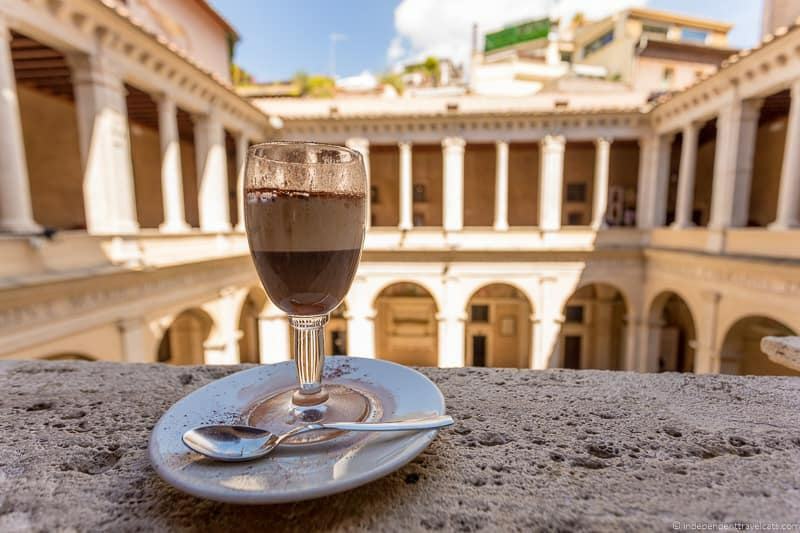 If you are enjoying your coffee in a popular tourist area (e.g., the Piazza Navona) and are trying to save money, resist the urge to order other drinks and food. It can be tempting to just settle down and have a meal, but you’ll find better prices if you venture further away from the popular attractions and piazzas. Service can feel slow and a bit unfriendly in Rome, especially if you are from a country with a strong emphasis on customer service (e.g., United States). Rome, and other major tourist cities in Italy like Venice, don’t have the best reputation for customer focused service. That said, we have never had terrible service ourselves and generally as long as you are respectful and friendly with the staff, service is fine. Speaking, or attempting, a little Italian for greetings, to say thank you, to order, to ask for directions, etc. are very much appreciated and can help. Not all staff speak much English, so this will certainly help. If you are ordering at the bar, or waiting for table service, sometimes you do need to be proactive and get people’s attention to get service, especially if a place is busy. Just be sure to try to do this without being rude or cutting in line in front of other customers. Places in popular areas and around tourist attractions are more likely to have higher prices and charge higher service charges. Although this may not make too much difference if you are just looking for a cup of coffee, I would take this into account when looking for food. Avoiding these places can also often help if you are looking for better service. A service charge is usually included on the final bill at Italian restaurants, usually noted as servizio incluso. This obligatory service charge often ranges from around 8% up to a steep 20%. This should legally be clearly stated somewhere on the menu, so do check the menu if you want to know whether it will be charged before ordering, or ask. Not all restaurants charge for service, but we found service charges more common than not. If a service charge is included, there is no expectation that you will tip or leave a gratuity beyond that charge, although you can if you want to. If there is no service charge on your restaurant bill, it is nice to leave a tip (10% or so), if you had good service. If you are at a café for just coffee, it is not common to leave a tip in Italy, but you can always round up to the nearest euro or leave some extra change if you had excellent service. Note that most Italian restaurants charge for bread, even if it is already on the table or brought without you asking, so if you do not want to pay for it you can refuse it and don’t eat it. It is normally a euro or two per person. The same goes for other little extras like bruschetta, olives, grissini (Italian breadsticks), limoncello, etc. Ask if these are included and what the cost for each is so you can decide if you want them or not. Most restaurants also charge for water (usually bottled). You can usually get tap water for free, and you can ask for tap water by saying “acqua di rubinetto”. However, we have had restaurants refuse to serve it to us saying it is undrinkable despite our arguments to the contrary. Many Italians do not drink tap water despite it being perfectly safe, and are huge consumers of bottled water. Consider bringing a water bottle to refill as you go, which will save you money and help the environment! A coperto is another common charge added to bills in some parts of Italy. This charge is for the use of the table, cutlery, plates, glasses, etc.,and space occupied, and its origin dates back to medieval times. However, this charge has been illegal in the Lazio region since 2006, so you should not have to worry about it in Rome! Note that the same law that made the coperto illegal in the Lazio region of Italy also made it illegal for restaurants to charge a obligator servizio charge unless it has been noted on the menu. If you are charged either of the above charges illegally (be sure to ask them where it is stated on the menu), you have every right to argue it with the waiter or manager and threaten to report them to Guardia di Finanza (the financial police). They will usually correct it for you. Tipping is not common in Italy. Romans will sometimes round up bills to the nearest euro or leave a euro or two at a cafe or restaurant for good service, but rarely more than that. You are certainly not expected to tip anything beyond a service charge that is commonly included on a bill. Most Romans do not tip for a cup of coffee, and it is not expected. Of course, if a waiter or staff member goes above and beyond, feel free to leave them a tip to say thank you. Now, if you are staying in luxury hotels or eating at fine dining restaurants, especially those geared to international tourists, tipping is more common and expected. So generally 10% to 15% would be customary. If in doubt, ask a local guide or hotel concierge to get an idea of what is common. Note that some waiters in Rome have been known to directly ask tourists for tips, particularly Americans. Many out of discomfort of not knowing what is customary leave tips. But just know that tipping, especially beyond a service charge, is not expected and you are only being asked because you are not Italian. If this happens and you do not want to leave a tip, just politely refuse. Yes, there are walking and even bike tours that stop for coffee in Rome. Some are focused on coffee and others just include it as part of a food tour or general Rome walking or cycling tour. A great way to learn more about Italian coffee and get an introduction to the city with a local guide. 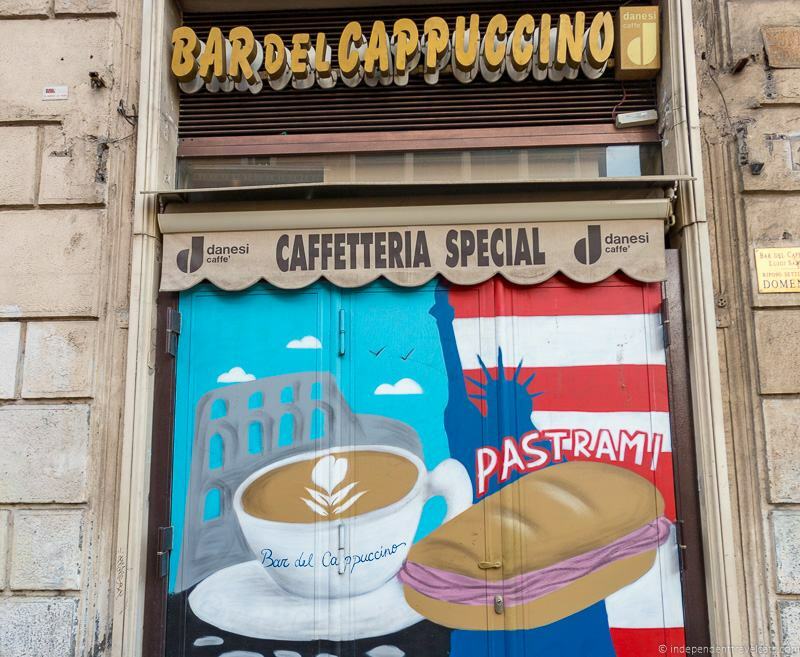 Espresso and gelato tour – This 2.5 hour walking tour takes you to several locations to taste some of Rome’s best coffee, pastries, and gelato! Roman squares walking tour – This 2.5 hour guided walking tour takes you to Rome’s most famous piazzas in Rome and you sample gelato, coffee, and tiramisu along the way! E-Bike tour – This 3 hour electric bike tour includes many of Rome’s most famous sights plus stops for gelato and coffee. Pizza making & food tour – This popular 3.5 hour food tour includes pizza making, a trattoria visit, gelato, coffee, and a dessert. A good way to sample several of Rome’s specialties in one go! 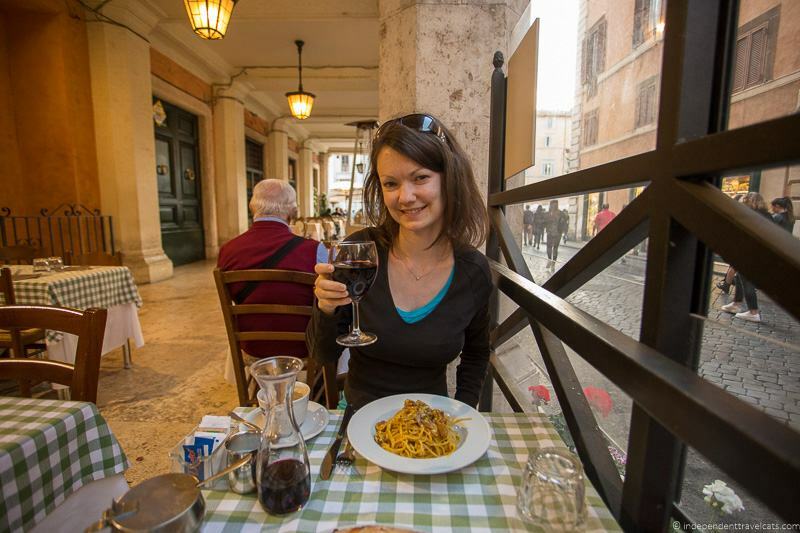 Half day food tour – This 4 hour walking food tour explores the Old Jewish Ghetto area and includes stops for coffee, pastries, Roman street food, and a glass of local wine. Private Barista Workshop – If you really want to learn more about Italian coffee and be able to make the perfect espresso for yourself, consider this 2 hour private barista workshop! Need a tea break in Rome? Rome is perhaps not the best city for tea drinkers, but don’t despair. We haven’t sought out a lot of tea places in Rome, but we can recommend Babington’s, which has been serving tea next to the Spanish Steps for over 100 years. The tea rooms were originally started by two English ladies who wanted to offer up proper tea to British visitors, and today it still serves up a very English tea experience. It’s busy so we recommend booking a table for tea in advance through their website. They also serve coffee of course so can satisfy both tea and coffee drinkers! Here are our 12 picks for the best coffee in Rome. 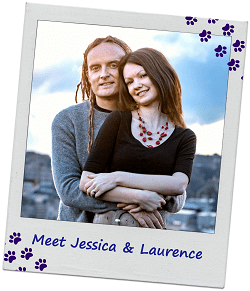 We have personally been to all these cafes and coffeehouses! Our primarily consideration was the coffee, of course! But we also factored in location, ambience, history, and uniqueness. 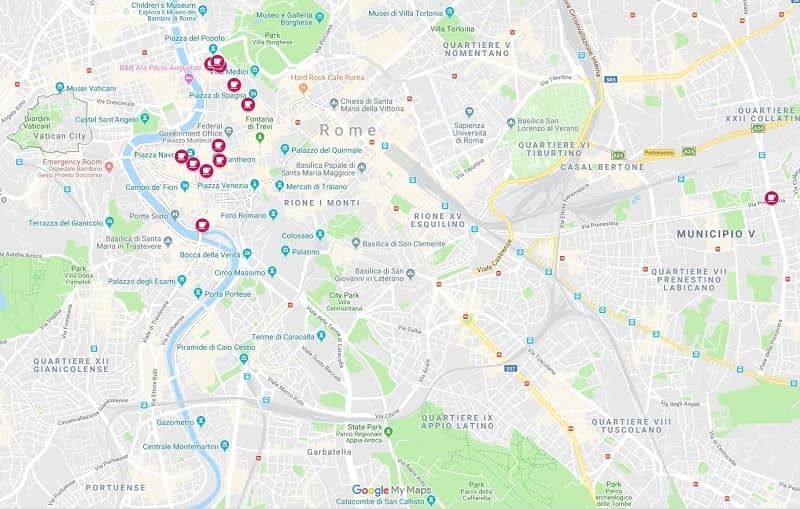 Since most visitors to Rome stick to central Rome, we chose mostly locations within that area, but threw in a couple outside the main tourist areas. These are just some suggestions, but to be honest, you’ll find good coffee in Rome at most places. It is considered very embarrassing to be criticized for serving bad coffee in Italy. So any espresso based drink is probably going to be pretty good no matter where you go, especially if you see locals standing at the bar inside. Note that we recommend these places for coffee, not necessarily for meals. 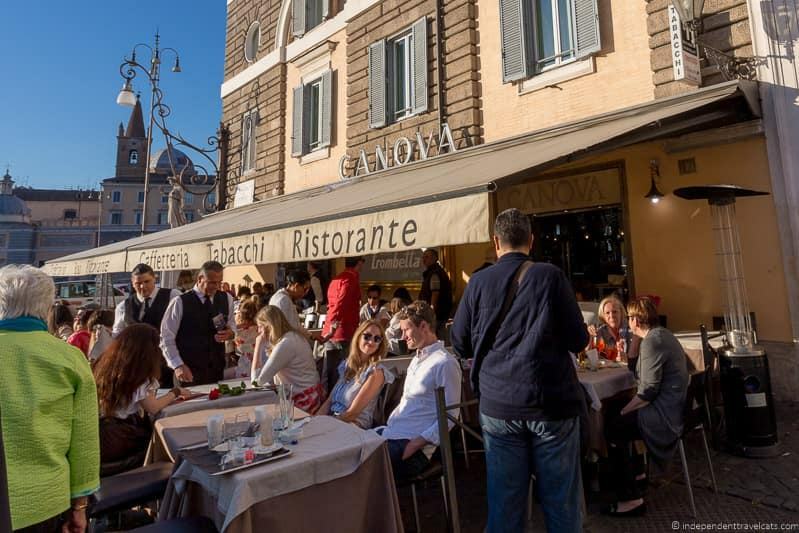 The cafes located in popular areas, such as Piazza Navona and Piazza del Popolo, are going to charge more for the same quality food you can find further away for lower prices. Just bear in mind you will pay more for central and scenic locations. 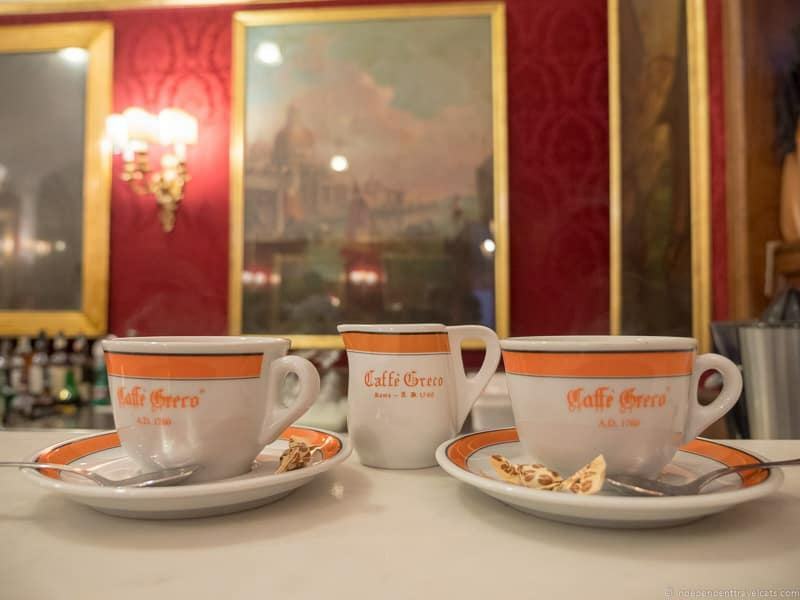 If you want to drink coffee in the same cafe as the 19th century Romantic poets in Rome, such as Keats & Byron, then look no further than Antico Caffè Greco. 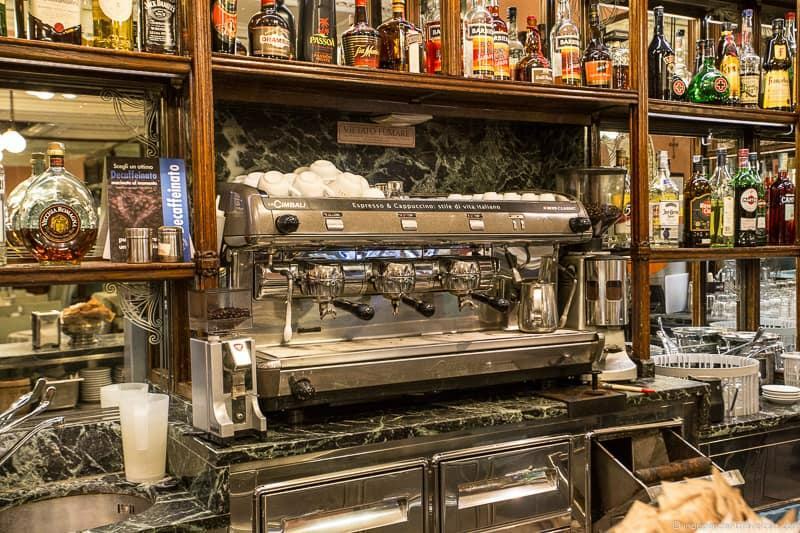 Opened in 1760 by Greek Nicola della Maddalena, Caffe Greco is the oldest bar in Rome, and the second oldest in Italy! It has been frequented by a number of artists, politicians, intellectuals, and celebrities over the centuries. 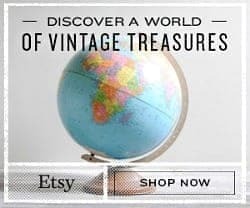 Some of its famous patrons have included Casanova (it even gets a mention in his memoirs), Goethe, John Keats, Lord Byron, Wilhelm Richard Wagner, Hans Christian Andersen, Giorgio de Chirico, and Mark Twain. 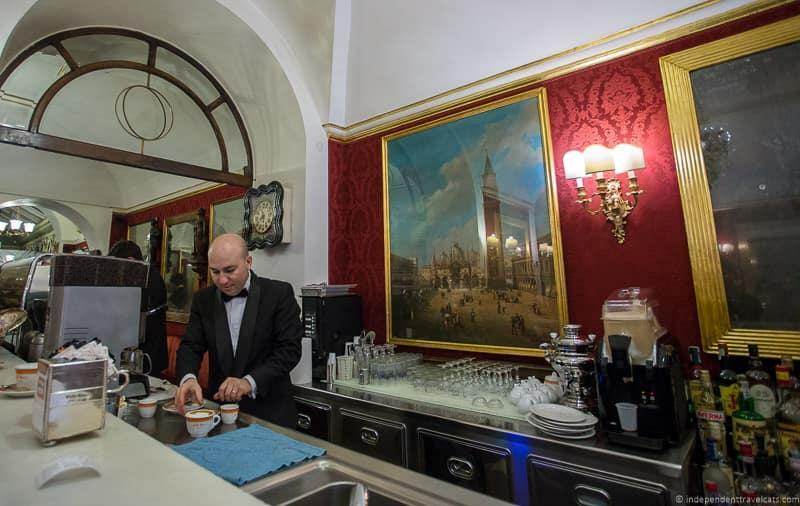 It’s still a popular spot, and one of the fanciest places to have coffee in Rome. 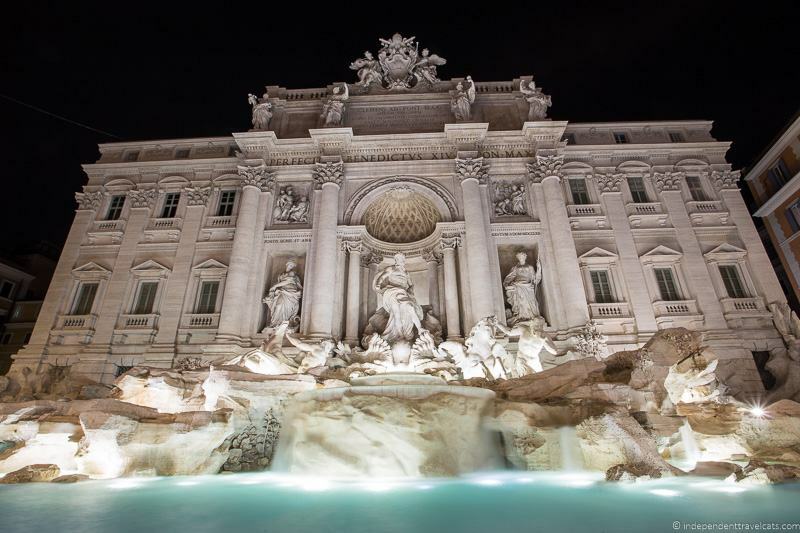 It has a convenient location near the Spanish Steps. The atmosphere inside is Old World with red velvet, gold decorations, damask-lined walls, marble tables, beautiful artwork on the walls, and references to famous patrons. Waiters wear tuxedos to serve patrons seated at tables. 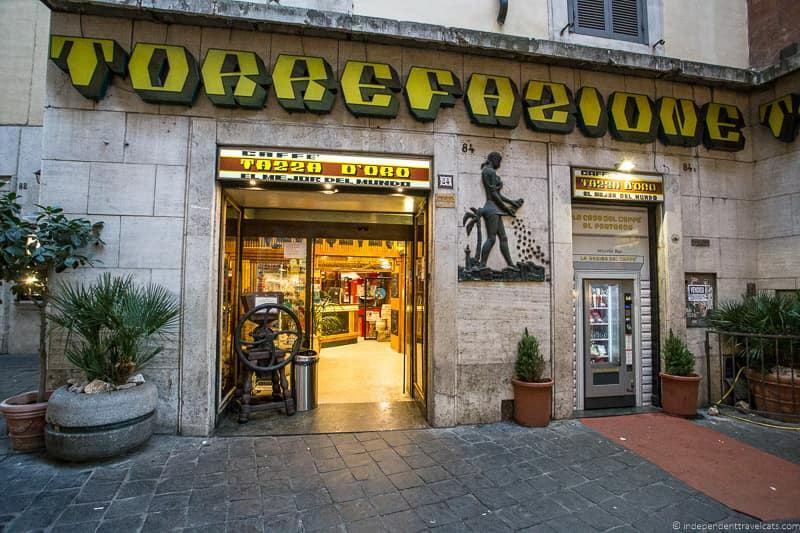 However, as you might imagine, Caffè Greco serves some of the highest priced coffee in Rome. A cup of coffee costs about 7 euros if you sit at a table! Antico Caffè Greco also offers sandwiches, pastries, and desserts. So you can linger here if you wish at a table and enjoy your coffee and cake. So if you like your coffee with some great Old World atmosphere, this is the place to come but expect high prices. If you just want the quickie experience, you can save money though by having a coffee at the bar. As you can see from our photos below, the bar (which is made of marble of course) is still beautiful. NOTE: The Antico Caffè Greco is currently under threat of closure or change in ownership as the property owner is asking for more rent from the coffeehouse. The cafe owner is fighting to keep it open and gain more cultural and heritage protection for the historic property. It would be very sad to see this place close! 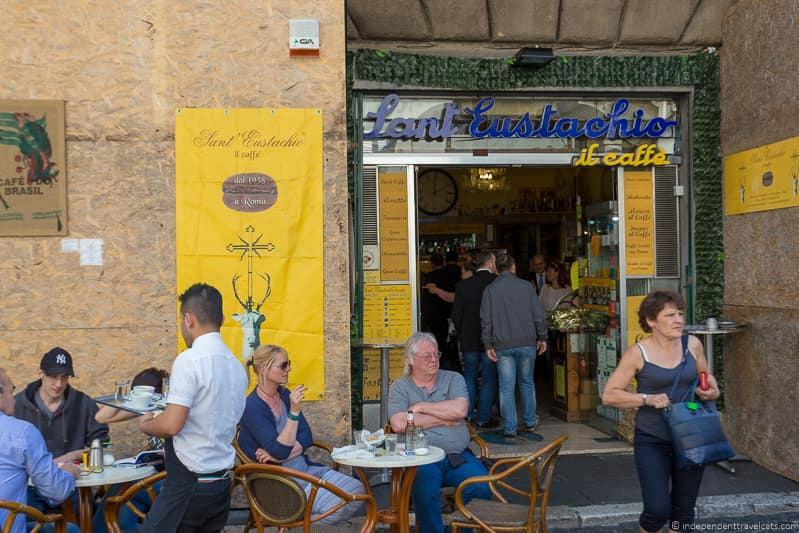 If you’re looking for a great cafe near the Pantheon, look no further than Sant’Eustachio il Caffè. The cafe dates back to 1938 and is located in a former old wood-fired roasting plant. The cafe roasts their own coffee beans, make their own blends, and the water used to make the coffee comes from an ancient aqueduct. The mosaic floors and furnishings in the shop are all original, so visiting Sant’ Estuachio really feels like stepping back in time. It’s not big, and it’s not flashy, but it’s definitely a contender for serving the best coffee in Rome. Which is what really matters. Some of their specialities include their Il Gran Caffè, Caffè d’Elite, and Il Gran Cappuccino. If you enjoy the coffee here, you can purchase the Sant Estuachio roasted coffee beans at the store and enjoy them back at home. Or you can purchase it online and have it delivered. Since 1944, Antigua Caffe Tazza D’oro has been in the coffee business and La Casa del Caffè al Pantheon opened in 1946. The company roasts, blends, sells, and serves its coffee in the historic center of Rome. Most of the space is a store, but there is a small bar area. The cafe is a stand up only affair, so you have to order and have your coffee at the bar, making it less of a leisurely stop and more for the coffee aficionado looking for a high quality fuel stop. You can also purchase La Tazza D’oro coffee at the cafe or elsewhere in Rome if you want to duplicate the experience at home or bring some back as a gift. You can also find and order it online. 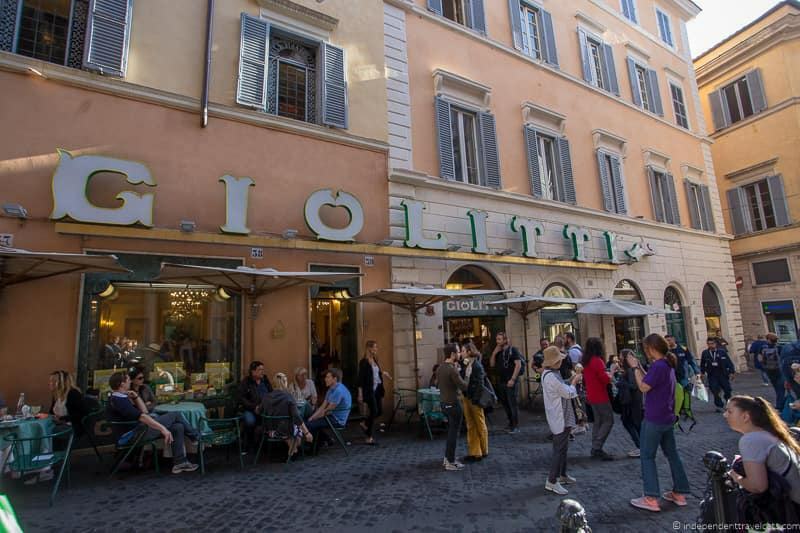 Giolitti is a seriously popular coffee stop that always seems to have a crowd of visitors and locals, and is well-known for offering quality ice cream and gelato as well as coffee. It has also attracted a number of politicians and celebrities including John Travolta, Ben Stiller, Owen Wilson, and the Obama daughters Sasha and Malia. For some reason, many people have said that Giolitti was featured in the film The Roman Holiday with Audrey Hepburn and Gregory Peck but she clearly buys gelato from an unnamed gelato cart in front of the Spanish Steps. But, nonetheless, still a film worth watching before your trip to Rome! 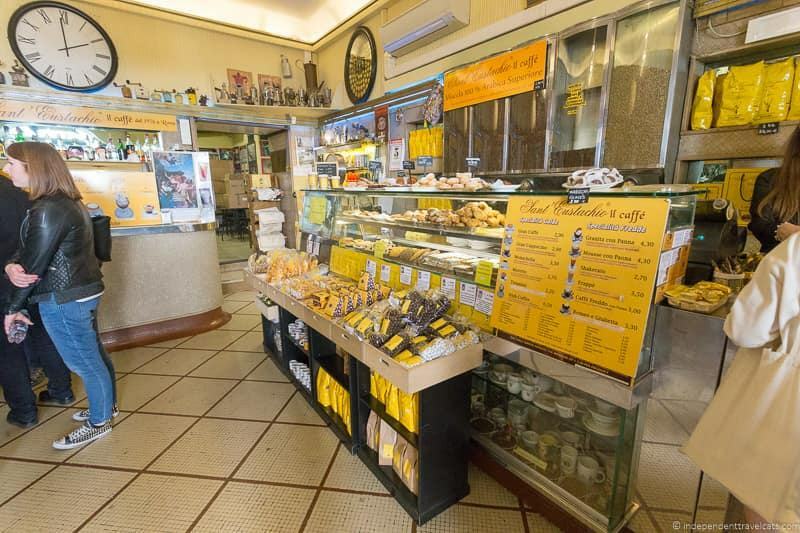 Giolitti is close to the Pantheon, making this a great central option. Note that there are separate lines for gelato and coffee. The longer lines are normally for gelato while it is normally not much of a wait if you only want coffee. Having your coffee at the bar is the most cost-effective and fastest way to get your espresso fix. Giolitti also made our list for the best gelato in Rome, so this is an excellent one stop location to try two Italian classics. 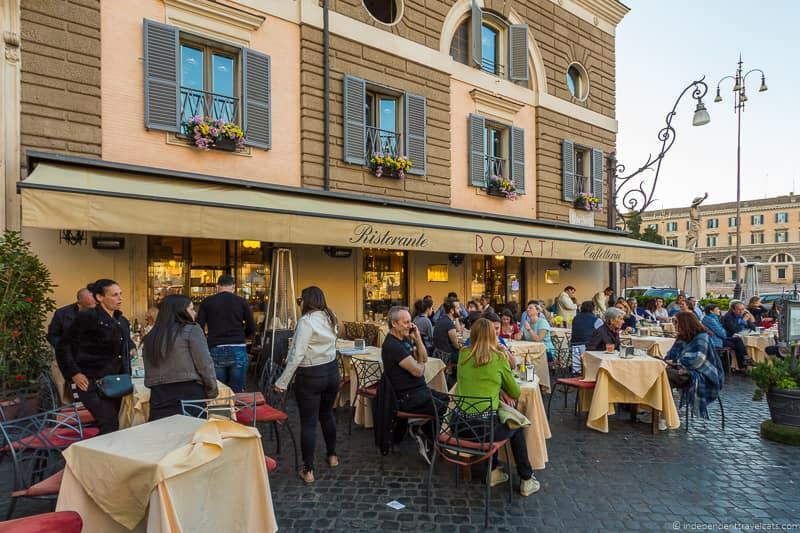 Found on the popular Piazza Navona, within view of Bernini’s Fontana dei Quattro Fiumi (Fountain of the Four Rivers), Caffè Domiziano is a popular spot to have a coffee on the piazza. From here you can watch the tourists and the world go by. Domiziano is also a full-service restaurant, and is rated as having some of the best pizza in town. So if you want pizza to go with your coffee, this might be the place to come. They also have a huge ice cream menu as well as a full bar serving everything from wine to cocktails to Scottish whisky. Note that there are a variety of seating options here, and the prices for sitting on the terrace overlooking Piazza Navona are somewhat higher than the prices if you sit inside. If you sit inside, you get the same food and drinks, just with less of a view. We did this and still had a nice experience here. But an outside seat gives you a nice view upon the Piazza Navona which is almost always busy and is perfect for people watching! Rosati dates back to the 1920’s and offers a nice venue that has kept much of its historical interior details. It is most popular however for its wonderful location within the Piazza del Popolo. The Piazza del Popolo sits at the northern end of the Via del Corso, and was for a long time the first entry point to the city of Rome for most travelers and a place of executions. The coffee here gets good reviews, and is a good place to consider if you want your coffee along with good views over the piazza. From the outdoor terrace seating, you’ll have great views of the Piazza del Popolo which includes twin churches, an Egyptian obelisk, and a number of fountains. It is a busy square and a great spot for people watching on a nice day. Rosati also serves meals, pastries, and other drinks. In addition to the outdoor terrace seating there is also a large indoor restaurant area. Note that prices are a bit higher here (and elsewhere on the Piazza de Popolo) than usual and there is a hefty obligatory service charge at Rosati, which at last check was 19% of the bill. This often lead to negative customer reviews from those who did not check the prices before ordering. So you pay extra for the location here! Our next recommendation is a cafe located within the art museum Chiostro del Bramante. The art museum hosts a rotating exhibitions of classical art centered around a 15th century cloister designed by famous Italian architect Donato Bromante. Chiostro del Bramante is a bit of a hidden attraction in Rome. It’s found down a cobbled street off Piazza Navona, next door to the magnificent 15th century Santa Maria della Pace church. This church is worth a visit and is home to a fresco by Raphael. From within the inside of the café, there’s also a window from where you can see into the Santa Maria church where you can get a view of the Raphael fresco. The café recommended their macchiatone, a long coffee drink in a cappuccino cup that is topped with frothed milk. Sort of a cross between a cappuccino and macchiato. We also had what is called their Bramante Coffee, which is a coffee cocktail of sorts served in a wine glass which we think included coffee, chocolate cream, frothed milk, and a sprinkling of chocolate powder. You can drink your coffee inside or along the cloister walkway overlooking the central courtyard, which is what we did. The café also serves breakfast, lunch, snacks, and cocktails. The museum also includes a bookshop. There is an admission fee required to visit the art exhibitions (you can check to see what’s on during your visit to decide), but the cafe and bookshop can be visited for free. Despite visiting Rome numerous times, we had no idea this place existed until we took a Context walking tour of Rome, and our guide revealed this cafe to us as one of his favorites. We later went back to enjoy coffee and a snack here. And now we can share that with you! Mondi have been roasting coffee since 1959, and today you can enjoy an espresso made from freshly roasted coffee in their cafe. Mondi is located in the eastern part of Rome, further away from the center of Rome than the other locations on our list. 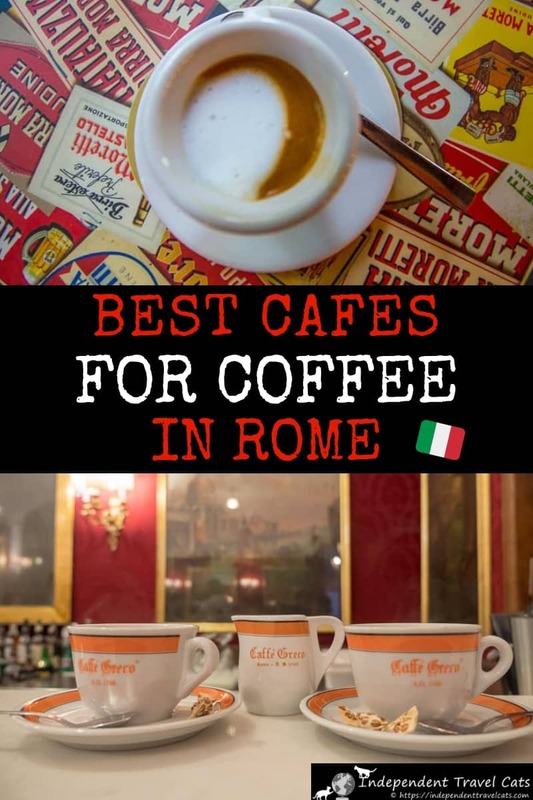 However, we think it’s worth the extra effort if you are traveling through that part of the city as they are known for serving one of the best cups of coffee in Rome. The reason for this is that Mondi is primarily a coffee roaster, and a large number of cafes in Rome actually serve their coffee. They also run training courses for baristas, and also do tasting events around the city. Suffice to say, they know what they are doing when it comes to coffee. So why not skip the middleman, and come straight to the source for your freshly roasted coffee? If you come here, we recommend keeping it simple and going for the caffè (espresso). They also offer food, pastries, and other drinks. Prices are very reasonable here since its away from all of the main tourist attractions in Rome. If you’re hankering for a cappuccino rather than the more traditional espresso shot, the Bar del Cappuccino is the place to come. They do serve a full range of coffee options, but their speciality, as the name suggests, is cappuccino, which comes hand-decorated. As well as the usual hot coffee beverages, they also offer a cold cappuccino option that is perfect for hot days. They also serve sandwiches and pastries. Although best known for their cappuccinos, their pastrami sandwiches are also very popular and another reason many locals stop here. 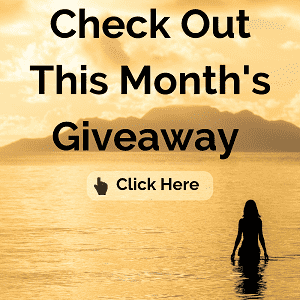 It’s a little bit off the beaten path compared to most of our other suggestions, in that it is not next to any huge tourist attractions, so it gets far fewer tourists. But it is not that you have to go too far out of your way to find it either. The location is near the Roman Jewish Ghetto area and near Ponte Sisto. Note that although many of our recommended locations are open in the evening, because the focus here is on cappuccinos and pastrami, they open early but close by 5pm or 6pm each evening. 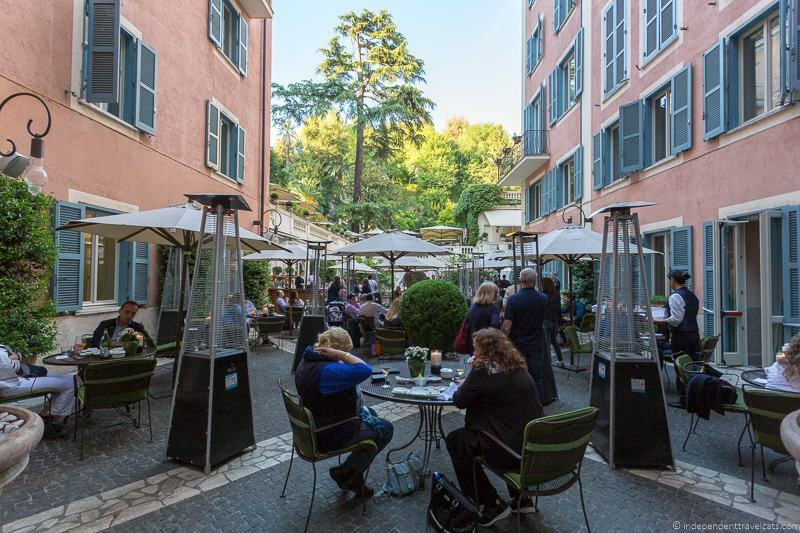 If you’re looking for an upscale place to be seen drinking coffee in Rome, look no further than the glamorous Stravinskij Bar at the Hotel de Russie, one of Rome’s top rated five-star hotels. The property dates from the 19th century (although has been somewhat updated since then! ), and you can enjoy a coffee in their open-air garden (Le Jardin de Russie) or in their bar lounge (Stravinskij Bar). This is definitely a nice little garden oasis in the middle of a busy part of Rome! Naturally, the bar also offers a full drink menu and cocktails. Patrons have included Brad Pitt, and the coffee here is excellent. A full dining menu is also offered in Le Jardin de Russie, including a caviar menu. Canova is another option at Piazza del Popolo and is another excellent choice for coffee in Rome. You certainly won’t be short of coffee options at this piazza! There is seating both on the outdoor terrace area with great views of the piazza or inside the restaurant. Outdoor seating is a popular option at Canova as you can see the square and sip your coffee and people watch with a beautiful backdrop. Canova also offer a full food menu, gelato, other drinks, and a “fast lunch” menu which may be a good option for those in a hurry but who don’t want to skimp on quality. They also have a range of gelatos, and even a tobacconist store inside which specializes in cigars. Note that like the other piazza options, you’ll pay extra here compared to other cafes in Rome. So do check prices before sitting down. If you are a fan of the 1990’s TV show “Friends”, this is the restaurant Monica is taken to by her date for Italian food in Season 3, Episode 18 (“The One with the Hypnosis Tape”). They are shown eating dinner inside the restaurant. Not to be confused with the similarly named coffee spot above, this café and restaurant was once the sculpture studio of Italian sculptor Antonio Canova. Canova was a well-known artist most famous for his marble sculptures, and today you can find his sculptures displayed in famous art museums worldwide including the Louvre, Victoria & Albert Museum, and the Borghese Gallery in Rome. Canova was a forward thinking chap, who when signing the contract for the property back in 1818, stipulated that the building could only be used as a sculpture workshop. His student sculptor Adamo Tadolino worked here as well. It was used as such until 1967. 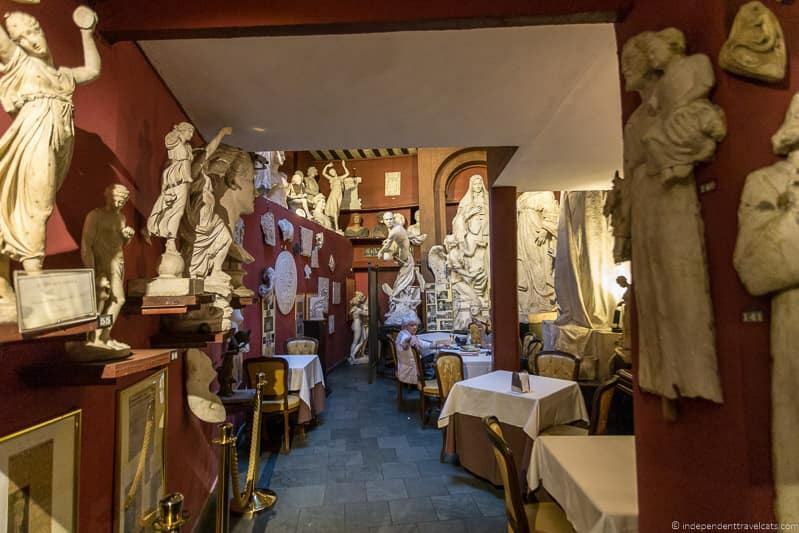 Today, Cafe Cavona honors the artist and his student Adamo Tadolino, as well as generations of sculptors who worked here, by filling the whole building with a huge sculpture collection, spanning various works including some by both Canova and Tadolino. Tables and chairs are tucked away amongst these exhibits in a warren like cosy atmosphere. As well as coffee, you can also get food and alcoholic drinks here. Although the coffee wasn’t particularly the best we had in Rome, we loved the atmosphere here. Jess loved the feeling of having coffee amongst the art so it was a standout place for her. So that’s our guide to coffee in Rome, we hope you found it helpful! If you are planning a trip to Rome, we also recommend checking out our articles on planning a 3 day Rome itinerary, visiting the Borghese Gallery, our Rome walking tour focused on the Romantic poets, and our guide to the best gelato spots in Rome. Have you had coffee in Rome? If so, tell us about your experience and the name of your favorite cafe (if you remember). We’re always looking for recommendations for our next visit to Rome! If you are planning a trip to Rome, and have any questions about ordering coffee, cafés in Rome, or just general travel in Rome, just leave us your question in the Comments section below! Hi, I wanted to drop a note and thank you for this honest review and down to earth advice of Rome’s bars. We will be visiting the Mediterranean next summer and I want to keep the spending to a dull roar. We love to do tasting tours in new places and appreciate all the tips. Loved the inclusion of some to the touring co’s used and pic’s are always welcome. Thanks for taking the time. Wow, This is really a exciting news for all coffee freaks like me. I always like to check out different places coffee. This is one kind of my hobby. 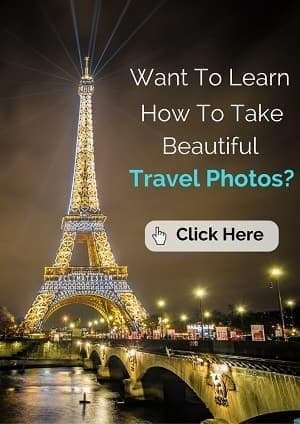 So, I must check it out when I am going for Rome Italy. Thank you so much for sharing this exciting information. Hi Anna, So glad you enjoyed it! Yes, it is good that even if you have a hard time drinking a plain espresso, there are lots of espresso based drinks people can try. The opening of Starbucks in Italy is a bit surprising. Howard Shultz actually got inspired to serve espresso because of his coffee experience in Milan (which is where the first one opened in Italy) and it is really different than a normal Starbucks with different options. But the future ones will be like more traditional Starbucks. The first one appears to have gotten mostly positive feedback and reviews, but it will be interesting to see how things go if they open more stores. Normally, I am not a big coffee person but I did enjoy the coffee in Italy. I definitely have a lot to learn about all the different types. Your list of “bars” all sound good. I think I would start with the one in Piazza Navona, I just love the people watching there. My daughter had a very similar experience when she was studying abroad in Spain: bars, drink standing up at the bar, etc. I guess some of these traditions pass country lines (she was in Valencia.) I think I would personally greatly enjoy the espresso and gelato tour, although I must admit that I don’t do so well with the straight shots of coffee. I’m usually happy to come back and drink American coffee, which I know Europeans think is terrible:) Still, part of traveling is stepping into new experiences, and I love coffee, so this is a great resource. Hi Seana, YES, that is a good point, I was going to write that drinking coffee at bar in Italy is similar to many other countries and we’ve also done it in France and Spain (although in both we’ve noted more seated locals). But definitely in France in the mornings, we’d sometimes get a coffee fix at the bar standing before setting out. So it is not unique to Italy but I think maybe more typical and the norm here. I have a hard time drinking coffee of any kind black, so normally need at least a tiny bit of milk. But the great thing is that you can still get milky coffees and of course add sugar to taste, so you can probably still find something you would enjoy. Yes, I think our coffee tastes depend a lot on what we are used to whether it is for thick Turkish coffee, Italian espresso, traditionally brewed filter coffee, or instant coffee. It is fun to try new types of drinks when traveling but always nice to return to what you are used to as well! Oh my husband will find this very very useful! I am not a big coffee drinker unless it doesn’t take like coffee, but when in Rome, do as the Romans do, I guess! The Shakerato sounds like it could be for me! Pinned!